We still don’t want the Flyover. We still think it’s a dumb idea and a huge waste of money. A lovely wrought iron fence adorned with butterflies and flowers, plus, new trees and perennials! Thank You for listening to Wilton neighbors’ serious concerns, and working hard to make this all less painful…even quite pretty! The CTA appreciates your patience during Major League Baseball playoff season as we work to schedule meetings that don’t conflict with catching Chicago Cubs games! The Chicago Transit Authority (CTA), in conjunction with the Chicago Department of Planning and Development, is continuing its redevelopment study to complement the Red and Purple Modernization transit construction project (RPM Phase One). 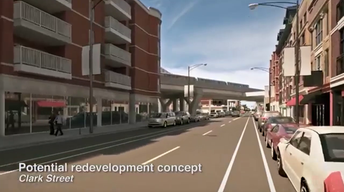 The purpose of this Transit Oriented Development (TOD) study is to encourage specific, community-supported redevelopment strategies for portions of land required for the transit construction project that could be made available for redevelopment after construction.